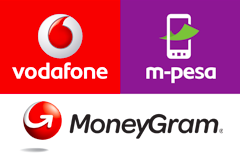 Vodafone links its M-Pesa mobile payments service with MoneyGram money transfer services. Both Vodafone and MoneyGram have teamed up to enable consumers to transfer funds directly from around 200 countries to the millions of users of M-Pesa. This service will be launched in key markets during the second quarter of 2014, with additional roll-out planned throughout the remainder of the year. The agreement will allow consumers who visit MoneyGram's 334,000 agents across the globe to send funds directly to M-Pesa accounts. MoneyGram customers can also transfer money to an M-Pesa user through its website or mobile apps on iPhone, Android and Windows 8 phones. For those of you who are new to the M-Pesa – which allows customers to pay bills and withdraw, transfer and deposit money easily – it is now available in the following countries – the Democratic Republic of Congo, Egypt, Fiji, India, Kenya, Lesotho, Mozambique, South Africa and Tanzania. Additional markets are due to launch M-Pesa during 2014. The World Bank estimates that more than half of all inhabitants in the countries in which M-Pesa is available do not have access to a traditional bank account. With most of these inhabitants belonging to low-income rural areas and becoming increasingly reliant on cross-border transfers, mobile money provides a simple and low-cost method for geographically dispersed families to bank and transfer funds. 0 comments on "MoneyGram and Vodafone M-Pesa mobile payment services to be linked"